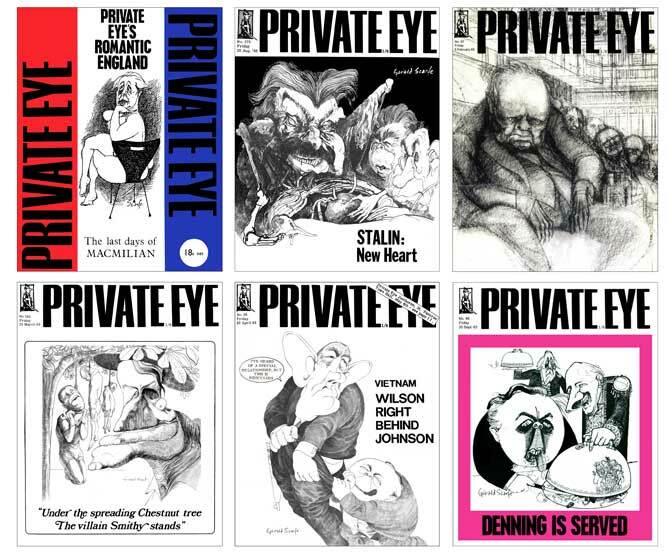 A set of 6 of Gerald Scarfe's iconic cover illustrations for Private Eye magazine. The set consists of: Harold Wilson & Lord Denning; Winston Churchill; Ian Smith; Stalin; Harold MacMillan in Keeler pose for the Private Eye annual; President Johnson & Harold Wilson. Each print is 21cm x 29cm. The cost of buying each individual print at this size via our web site is £100, but buying the set offers a saving of £110. Prints are all hand signed by Gerald Scarfe.